New registration procedures: There will be no lottery for swim lessons for the Late Spring session. It will be first come, first serve. Photo by: Cristina Nichitus, via Free Images. East Meadow, NY - April 15, 2016 - Building upon his Fit Nassau initiative to help residents live a healthy lifestyle, Nassau County Executive Edward P. Mangano today announced the upcoming registration dates for the 2016 Late Spring Session Land and Aquatic Fitness Classes and Children’s Swim Lessons at the Nassau County Aquatic Center. ** NEW REGISTRATION PROCEDURES ** We will NOT be holding a lottery for swim lessons for the Late Spring session. Instead, we will have a 1-day first-come, first serve registration line for lessons. Wednesday, April 20, 2016 at 6:00 p.m.
• First come, first serve & must be done in-person. Places in line can-not be held for someone else. You will be issued a number starting at 5:00 p.m. in the order in which you arrive and will be called up to the desk to register by number starting at 6:00 p.m.
• Leisure pass required at time of registration; we cannot look up your Leisure Pass. Only a parent/guardian or grandparent may register the child; you may NOT register a friend. • Full payment due at time of registration (cash, check, Visa, Mastercard, Amex.) No refunds or make-ups are allowed, so please make sure you are signing up your child for the correct level. Pre-registration is recommended for new participants only. It does not guarantee you a spot in a class, however it will aid in making the day of registration go much quicker for you. It requires a Nassau County Leisure Pass, children’s names and dates of birth, only. It’s a quick process that you can do any time between now and the registration date. Must be done in person. Infant/Toddler classes: Ages 6 mos-36 months. Each child must be accompanied in the water by an adult. Swim with Me: Ages 3-4 years. Each child must be accompanied in the water by an adult. Registration begins Monday, April 25th at 8:00 a.m.
• Leisure Pass is required at time of registration. We cannot look up a Leisure Pass in the computer. • Sign up is first come, first serve and must be done in person. Places in the line cannot be held for someone else. Upon arrival, you must go the end of the line. • Payment in full is due at the time of registration. No refunds or make-ups are allowed. • Registration is on-going during business hours until classes fill. • You may not sign up for more than 2 aquatic fitness classes on the first registration day. 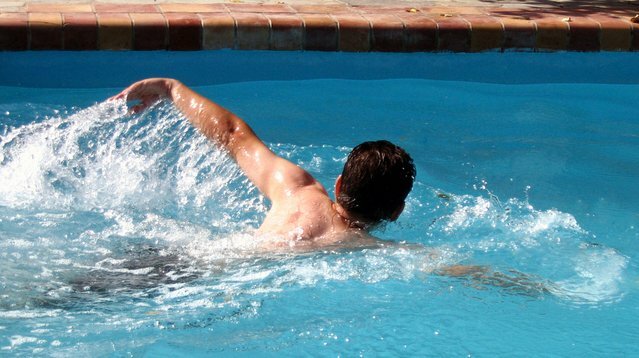 Aquatic fitness classes are held Monday through Friday, with specific concentrations assigned to each time slot. The class offerings include Adult Fit Swim and Aquaerobics. Fees vary based on length of each class. Land Exercise Classes are held Monday through Thursday, with a varied schedule throughout the day and specific concentrations assigned to each time slot. The class offerings include Fit and Fabulous Seniors, Pilates, Spinning, Senior Wake-up and Dance, Cardio Kickboxing, Tai Chi, Healthy Back, Intense Body Transformation, Spinning, Yoga, Core and Stretch, Lunch Time Dance Party, Lunchtime Fitness, Yin Yoga, Spin Camp, Zumba, Beginning Weight Training, Insanity, Extreme Conditioning, Triathlon Training, and Strength Training Essentials for Runners. Fees vary per class. For a detailed listing of class offerings, please call the Aquatic Center at: (516) 572-0501 or visit the Nassau County Parks, Recreation and Museums website. Centrally located in Eisenhower Park on Merrick Avenue in East Meadow, the Nassau County Aquatic Center is one of the premier swimming facilities in the country. Built in 1998 for the Goodwill Games, it serves the general public as well as competitive swimmers. The Aquatic Center regularly hosts college and local high school competitive swimming and diving meets and has hosted scores of Olympians, including Michael Phelps. Subject: LongIsland.com - Your Name sent you Article details of "Mangano Announces Registration Dates For Late Spring Session Fitness Classes And Children's Swim Lessons At The Aquatic Center"